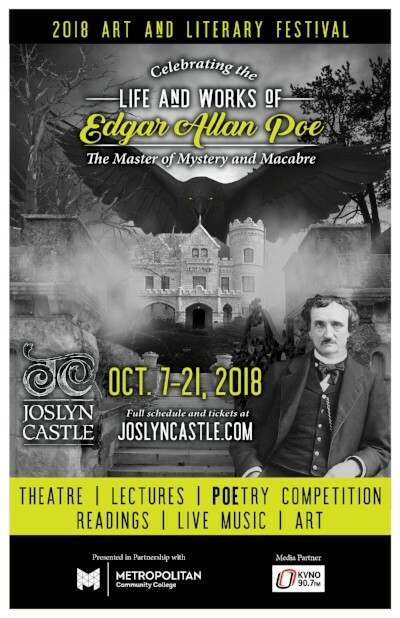 Join us for an evening of POE-try created by local POE-ts, and inspired by Edgar Allan Poe! We issued a challenge to the public to create a piece that is influenced by the language, subjects, rhythm, or tone of the one and only master of mystery and macabre. The finalists will discuss their creative process and deliver their pieces in front of an audience in our Music Room. This is a free event that is open to the public. Art created by local artists will be on display and Joslyn Castle bar will be open, so bring cash to enjoy a drink. A performance of "Tales of Poe" will follow at 7:30pm, and reservations are required for this portion of the evening.